Welcome to 2018 and Happy Full Super Wolf Moon! Artist: Unknown, please let us know if you do! Before you partake in leading a moon ceremony, it is good to know the intention you wish to invoke and manifest this Full Moon. This will be the anchor for everything you do within the ceremony and will help guide you. Because it is a new year, you could do a Word of the Year ceremony with your tribe. You can read how we did ours here last year. The theme could be releasing 2017 or the theme can be self-love, abundance... whatever it may be this will be the focus of your moon ceremony. It is time to set Sacred Space. Where are you having the ceremony? Are you having it in your living room, or outdoors in a park or at the beach? Your environment will also play a vital role through the ceremony. What objects will you need for your ceremony? Will you be creating a potion or some kind of craft? You can also designate sistars to bring certain items. I also always suggest having items for each element: Air, Fire, Water, and Earth. you would place all your ceremony items on your altar... this will be the focal point of your Moon ceremony. Moon water for the Water element... Preferably the water of this current Full Moon. Set water out under the moon for at least 2 hours before the ceremony in a glass or silver bowl or glass pitcher. Fill your chalice with Moon Water and place it on your altar. For Earth you can have a little bowl of salt, a bit of bread or apple slices, or you can create Moon cakes! Also any stones from the mineral Kingdom would be amazing on your altar. Candles, music, blankets and pillows for your guests to sit on, a drum, your divination tools including our spirit de la lune deck, all would be great resources to dive deeper into the full moon with your tribe. When you set the ambiance... you can drop into your magick very quickly! Moon signs can play a vital role in the energy of the Full Moon. This Full Moon will take place for some people on Jan. 1st in the sign of Cancer... But also early on Jan. 2nd depending on your time zone and location. Our planners are all in UTC time so our planner says the Full Moon is January 2nd, but always use an app that is connected to your actual location for the most accurate Moon phase and moon sign. A Cancer Full Moon is very cozy in this phase because Cancer is ruled by the Moon in astrology. 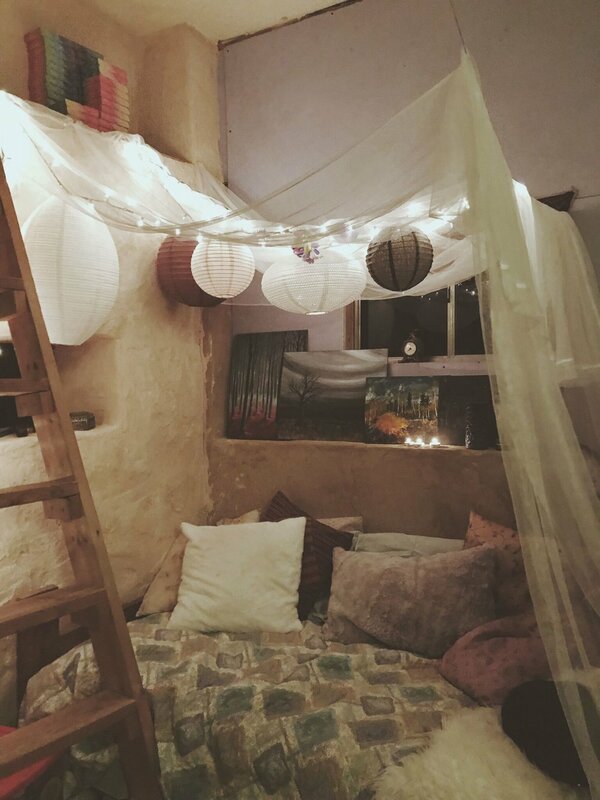 Having a Full Moon ceremony at home can add extra coziness, which Cancer loves, or on the beach would be an amazing experience for Cancer, the crab! Research other Moon signs so you can create different ceremonies and invoke different energies for each of the Full Moons for 2018! Once all your sistars are here with you, it is time to cast a circle for protection and creating a magical container for your ceremony. The elements play a profound role in manifesting our realities. We must honor each element in order to manifest our desires and maintain the balance of the energies of the circle. To open a circle you will go clockwise to build momentum. Whoever is leading the circle can call in all the elements or you can have different sistars at the different directions call in the Elements. It is up to you and your moon tribe! Here is a simple way to call on the elements in a circle. "On this Full moon night we call upon the element of Air, the winds of the East, to bless us in this rite. We welcome your whispers and thank you for your presence." Now take your smudge wand and light the herbs and let them smoke. Smudge your whole Aura field and body and then pass it on to the next sistar moving in a clockwise manner. Let her do the same and go around until everyone has cleansed themselves. During the circle it's important to stay quiet and meditative as you create this bubble for your magick to take place. Visualize a bright violet light surrounding your circle and your altar space. The element of air is now surrounding you. "We call upon the element of Fire, our sacred flame within to ignite and guide our circle on this Full Moon night. Thank you for your warmth and presence." Now light the candle that is designated for this element. Take the anointing oil that you have chosen for tonight's circle, and place a drop on the candle. Take a drop of oil for yourself and anoint your heart chakra. Pass the anointing oil around in a clockwise manner and let each sistar anoint her heart chakra before you continue. Visualize a bright Golden Light creating a circle of warmth around your sistars and your altar. "We invoke the oceans of the West. Under this luminous Full moon we call upon water to connect us to our intuition and our inner Moon tides. Bless our circle with healing, connection, and love. With this drink, we purify our intentions. Thank you for your presence." Take the chalice with Moon water and take a sip. Pass the chalice clockwise and let each sistar take a sip of the Moon water. Visualize a sapphire ocean surrounding your circle shimmering under the moonlight. "Under the Full Moon we call upon the energy of the Earth, our Great Mother who supports and nourishes us every day. May we always feel grounded and stay connected to our bodies, and to the love of Gaia. May this circle and this ceremony be of service to Mother Earth and to all sentient beings for the highest good of all. Thank you for your presence and protection." Take the plate of fruit or whatever food you have on your altar and eat a piece off the plate. if you have a bowl of salt, spring a little bit of salt in the direction of North, and sprinkle a little bit on your tongue. Savor the taste and be aware of all your senses in this moment. Pass the plate or bowl along to each sistar in a clockwise motion and stay connected to your body as you take in the element of Earth. Visualize a beautiful crystalline structure surrounding your circle. Have everyone face the center of the circle, and hold hands. Feel the the energy of the sistarhood growing stronger. Visualize the beautiful rings of the elements surrounding you and flowing through each of you! Ask everyone to call in their guides quietly, and invoke any deities you wish to work with. You are now ready to begin your ceremony! Now that the circle is cast, this would be a great time for each sistar to check in and state aloud their intentions for their own journey ahead. Be a witness to each person and allow their voice to be heard. When everyone feels ready, it is time to begin your ceremony! This is the part where you do your craft, make your potion, tell your stories, lead your meditation, etc. Whatever it is that you chose to do tonight this is the time to connect with each sistar, teach your magick, share your hopes and fears and dreams for 2018, etc. You have cast a circle and created the Sacred Space and container to do your work. Have fun, connect, be joyous and celebrate together under the Full Moon! In our Tune to the Moon Planner, we have a colorable Moondala for each Full Moon! You can color in the Wolf Moondala with your tribe! After you feel that your ceremony is completed, it is time for you and your tribe to close the circle. A lot of people close the circle going counter-clockwise, but that will usually seal off the energy... So keep this in mind: In your ceremony if you were bringing in new energy you do not want to seal it off yet. You would still want to move clockwise in your circle starting with the East again. If you were banishing old energy and releasing energy in your ceremony, then you would want to move counterclockwise starting with North or Earth element. Just keep those in mind and do what feels right to you. Stand facing North or East, and just say a heartfelt thank you to each element for their presence and witnessing your journey here tonight. Do this for each element and move in the direction that you feel is the right way to move for your circle. When you get to the element of Fire, snuff out the candle. After you thank all of the elements, face your altar and hold hands together. Feel your connection as a Sistarhood! Feel the energy of the Earth moving through you and feel the Moonlight flowing into you from the heavens. Move all this energy down from your hands and heart and into the Earth, sending all your love into Gaia. Ground the energy down as a collective. You can ask Gaia to take any residual energy and transmute it into something she can use for the land and her creatures, and thank Her and the Moon for their guidance and love. Thank all your guides and deities you invoked tonight! When doing spiritual work it is best to eat afterward so you can connect back into your body and literally digest the integrations and the energies that you just shifted and transformed within the circle. If you eat before, all your energy is going into digesting your food so your spiritual work probably wouldn't be as potent as it could be. You can make your moon circle a potluck and have each sistar bring snacks and dishes and have a feast! Make sure to leave a little offering plate outside for the fairies and to the spirits of the land. This is a time to connect and share what's been going on with you, and what was happening for you during the ceremony. Relax and be present with your tribe. We hope this helps you create a circle and gathering that is meaningful, magickal, and filled with love and joy and connection. You can use this little guide for each Full Moon and for each ceremony you do as a group. You can also adjust it for when you're going solo. We hope you have an amazing first Full Super Moon of the year, and that your 2018 is filled with Magick, love and abundance! 2018 Tune to the Moon Planner is here! 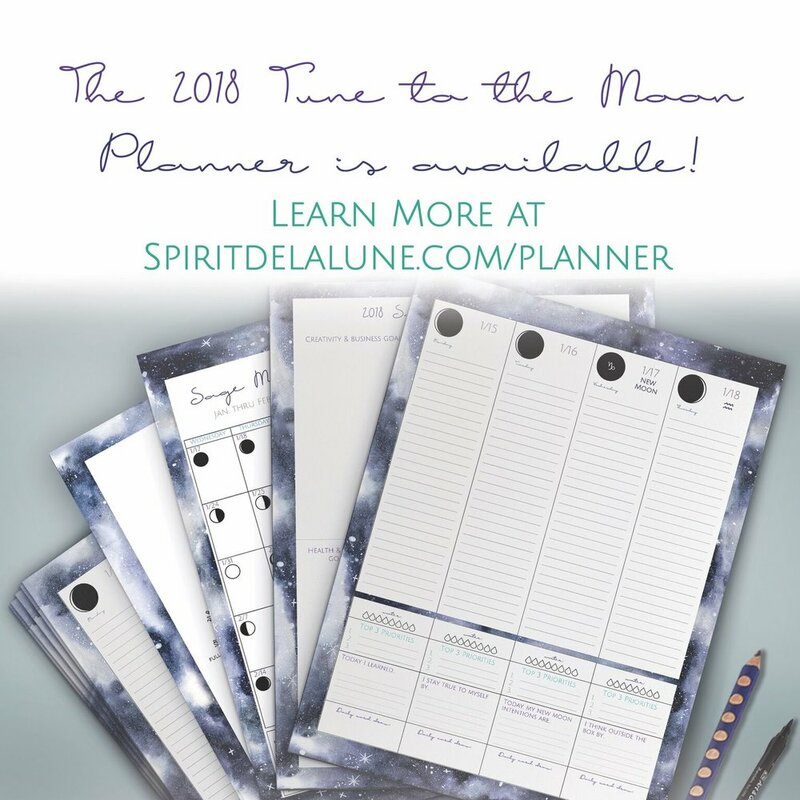 We also have our 2018 Tune to the Moon planner available to download to keep you in tune with the cosmos and the moon phases and cultivate magic with the elements in every moon phase and in every moon sign! You can also join our tune to the Moon Sisterhood if you feel called to a magical community! We also want to announce that 2018 calendars are being created, we are just a little late on the train! But it's better late than never and we thank you for your patience, support, and love with all our offerings! We are so excited to do this for you all! Sign up for our newsletter for updates and pre-orders very soon! Sign up with your email address to receive news and updates decks and calendars will be available very soon! Blessings to you and your tribe! Love you to the Moon and back!